• DESCRIPTION: BHS RC 300 Hydraulic powered Top Head Drive capable of drilling 5” & 5 ½” diameter Holes up to a depth of 300 meters for exploration purposes by RC Drilling Method and & 6” -6 ½” diameter holes upto a depth of 300 meters by AIR-DTH Drilling Method. 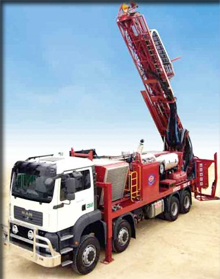 Reverse circulation drill rig capable of drilling 300 mtrs, for exploration drilling MODEL BHS RC-300 consists of Ashok Leyland Taurus Truck Model 2516/AMW 2518/ Equivalent, Top head drive unit, with Diesel powered Deck Engine driven hydraulics, 1 Ton auxiliary winch, water/ foam injection system, drill rod break out system, Hydraulic oil cooler assembly, sample collection cyclone, provision to carry the drill rods on platform etc. • CAPACITY: The rig is capable of drilling upto 5”-5 ½” dia holes for exploration purposes, by RC Drilling method to a depth of 300 meters. • TOP DRIVE ROTARY HEAD: Hydraulically operated Top Drive Rotary head powered by two Hydraulic Motors and having variable speed range of 0-150 rpm and capable of giving a torque of approx. 52,800 in-lbs. • FEED SYSTEM: Heavy duty, high strength, hydraulic cylinder is provided to accommodate 6 mtrs (20feet) long drill pipes and to handle 6Mtrs casing pipes. The pull back is of about 24,200 lbs and the pull down capacity to be 16,700 LBS. The feed system is actuated using hydraulic cylinder and wire rope system. The feed system incorporate arrangement to control and limit weight on the Drill Bit. Rapid and slow feed speed arrangement is provided to measure the down feed and hold back pressure of the system. AIR LINE LUBRICATOR: An inline oiler of 15 liters capacity and suitable for working pressure up to 500 PSI is provided for injecting oil in all compressed air stream complete with volume control provided. • SPLITTER: A well designed splitter for 50 Letters capacity is provided for sampling/ recovery for analysis. • COMPRESSOR PACKAGE (Optional) : Consists of ELGI Make Compressor of capacity 1100cfm/350PSI Model DZ 23044 with Cummins Engine Model KTA 1150C Mounted on Ashok Leyland Right hand drive Taurus Truck Model 2516/ AMW 2518/ Equivalent, complete with chequred sheet Platform, 4000ltrs capacity diesel tank, fitted with 4Nos Hydraulic leveling jacks, Valves, Pumps, and also 30mtrs x2” hose with required end fittings, tool boxes etc.